Me and My Doctor: Antibiotics: Your Choice or Everybody’s Business? Antibiotics: Your Choice or Everybody’s Business? We all know antibiotics are fairly standard treatment — and all of us want to make medical decisions with our physician in the privacy of the exam room. Whose business is it if you are given an antibiotic you don’t really need? Let’s say you (or your kid) has the flu — and you really want an antibiotic. The problem is that the flu (and most colds) is caused by a virus — which couldn’t care less about an antibiotic. Antibiotics only kill off bacteria — so your new drug will happily set off to kill many of the good bacteria in your system — like the kind that help you digest food and do other things you are fond of. In the meantime, some of the bacteria in your system will fight back and grow resistant to the drug. Over time these antibiotic­resistant bacteria spread through you, your family, and your community. It gets worse. Antibiotics are also given to animals being raised for food. There is some controversy over how much this happens (see below). Many advocates for our agricultural industry acknowledge that antibiotics used solely for growth promotion of animals, rather than to treat infections in those animals, need regulation. When these animals are given antibiotics, their system also produces stronger, more resistant bacteria — which we eat. As a bonus, when their manure is used to fertilize fields, our fresh fruits, vegetables, and other crops are exposed to the mutant bacteria, too. Over time our world has used antibiotics — one of the greatest developments of modern medicine — in a manner that has led, ironically, to bacteria we can’t treat. Sometimes the bacteria are associated with the most common infections (such as pneumococcus, which causes many child ear infections), but these ninja bacteria can get very, very scary. If you want three good horror stories take a look at MRSA; antibiotic­resistant gonorrhea; and the E. coli bacteria known as O157:H7, which has been associated with many dozens of outbreaks of contaminated food from lettuce to burgers and other foods, and which can cause life-threatening symptoms. (And although it is rarely due to resistant organisms or prior inappropriate use, I have to give a shout-out to the media favorite necrotizing fasciitis, caused by flesh­eating bacteria). I truly do not think doctors actively overutilize on purpose, and I do not think patients demand drugs that will hurt them and their communities. But this is where this issue gets really interesting. A finger can be pointed to certain regions of our country. 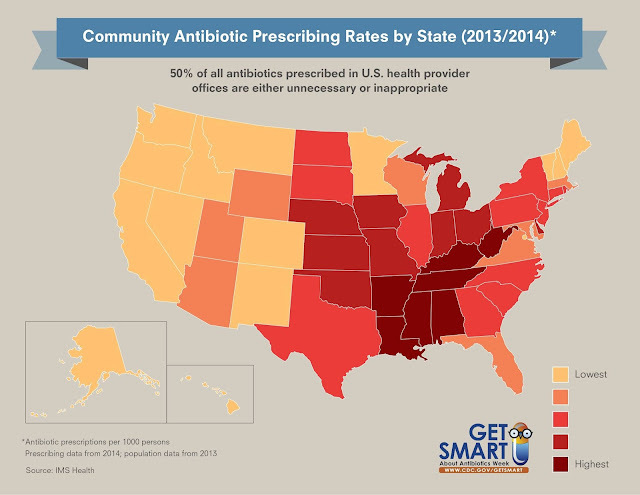 As this map from the Centers for Disease Control and Prevention so brilliantly illustrates, there are vast differences in how frequently antibiotics are used in different states. This would suggest that the level of utilization is based on regional culture as much as medical need. Find your state and see what your cultural attitude about antibiotics is. Are you sunshine yellow? Then your attitude about antibiotics likely will be different from a person’s in West Virginia or Kentucky — the states with the highest utilization of all (at least that was true in 2011). Are people in Indiana sicker than those in Illinois? 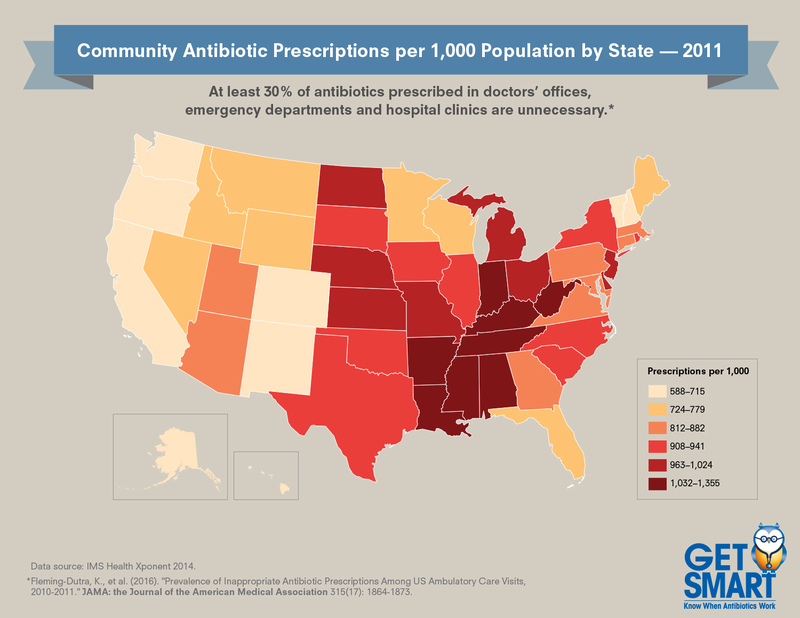 Do all the extra antibiotics in the Deep South make those populations healthier than Californians? My point is certainly not that the physicians of Wheeling or Bowling Green are worse than the doctors of Santa Barbara. I am also not saying the doctors in California always get it right, but looking at the averages is quite striking. It appears that “normal utilization” looks different to people in the redder states: both the physicians ordering more antibiotics and the patients requesting them. No one is suggesting you fail to follow your doctor’s orders, and it would be silly to start thinking of antibiotics as bad things. But there are steps every one of us can take that will help stop the growth of resistant bacteria. When you get an antibiotic, take it exactly as ordered, as long as ordered (cutting your treatment short, say to only six days when your doctor said 10, also fosters mutant bacteria). Don’t hoard antibiotics, and don’t take them without an evaluation to see if you have a bacterial illness that would even respond. You also should never share your antibiotics with others. Perhaps most of all: Stop asking for them. If you need one, you will be told that you do. 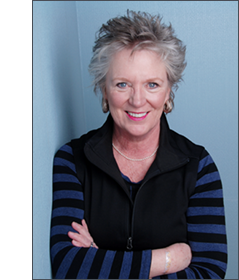 “Antibiotics are the only class of drugs that if we misuse can jeopardize not only our own health but also those around us. Because bacteria can become resistant to antibiotics quickly with use, it is imperative that we use them judiciously and appropriately to preserve their usefulness and lessen the chance they will be ineffective when we and our loved ones need them. “If you misuse your blood pressure medication you only hurt yourself. But with antibiotics we are all collectively hurting everybody. I sincerely hope you all hear those words as a call to action — to all of us, and for all of us.